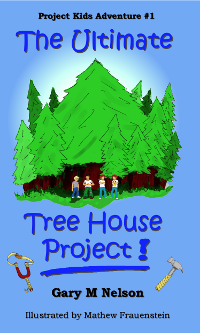 10 year old best friends Ben, James, Tim & Tom find the perfect tree in a forest near their school and begin to build the Ultimate Tree House. Things start with a bang, and get even worse when Ben’s sister Amanda discovers them working on their secret tree house. Next thing they know, the girls are building their own – in the same tree – and it looks even better than the boy’s! How are they doing it? What is their secret weapon? After the accident, everything changes and the boys are forced to team up with the girls – as if that would ever work! This book introduces basic Project Management concepts to children through an entertaining, funny story and simple lessons taught to one of the children by her father who is (of course) a Project Manager. She applies what she has learned and suddenly the girls are leaping ahead of the boys who had just “started building” – without a plan. Come join this unlikely band of tree house builders – four girls, four boys – as they end up working together to try and complete the Ultimate Tree House Project!